May 31, 2014  The U.S. is re-assessing what it has accomplished in more than 12 years of war in Afghanistan. NPR's Arun Rath speaks with Hassan Abbas, professor at the National Defense University and author of The Taliban Revival. May 31, 2014  The U.S. military has been working on a weapon that could strike remote targets quickly. NPR's Arun Rath talks with James Acton of the Carnegie Endowment for International Peace about the technology. May 30, 2014  U.S. Customs and Border Protection Commissioner Gil Kerlikowske has released documents regarding the use of force along the U.S.-Mexico border. May 30, 2014  Veterans Affairs Secretary Eric Shinseki apologized for lengthy waits at VA facilities, saying he's ousting the leaders of a VA hospital in Phoenix, Ariz., after stories about delays in care there. Shinseki's decision to resign marks a muddy end to an illustrious career, which began when he joined the Army nearly five decades ago. May 30, 2014  The U.S. State Department has confirmed that an American was involved in carrying out a suicide attack. The man, who was fighting in Syria against President Bashar Assad's regime, had ties to Florida. May 30, 2014  An affiliate of al-Qaida fighting against the Syrian government tweeted the "martyrdom" of the U.S. jihadi earlier this week. May 29, 2014  The National Security Agency says it has only one email exchange between the former contractor and the NSA's legal branch — concerning a technical issue. May 29, 2014  In a wide-ranging interview with NPR, the president says U.S. foreign policy in the 21st century should focus on diplomacy and counterterrorism rather than large-scale military operations. 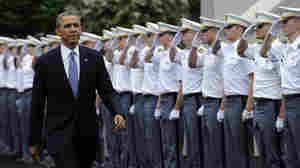 May 28, 2014  From his focus on peace instead of war to his praise for the U.S. stance in Ukraine, the president took a different tone Wednesday than he did in his 2009 commencement speech at the military academy. 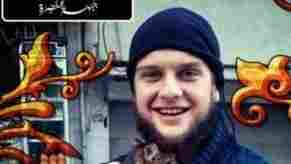 May 28, 2014  Al-Nusra Front, an al-Qaida-linked Syrian rebel group, says a U.S. citizen known as Abu Hurayra al-Amriki helped carry out a suicide attack on Sunday. Obama Calls For Further Support Of Syrian Rebels: What's Changed? May 28, 2014  Steve Inskeep of NPR's Morning Edition spoke with President Obama shortly after the president's speech to West Point graduates. He offers a brief preview of that conversation. May 28, 2014  Robert Siegel speaks to Robert Kagan of the Brookings Institution and Michele Flournoy, the former undersecretary of defense, about President Obama's commencement speech to West Point graduates. May 28, 2014  President Obama visited the U.S. Military Academy Wednesday, delivering a commencement speech to West Point cadets. He used the occasion to lay out a foreign policy vision based in pragmatism. 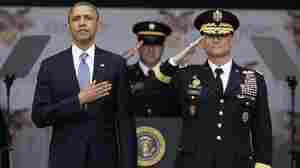 May 28, 2014  Speaking at West Point, Obama suggested the nation's "long season of war" was drawing to a close. Although the U.S. will continue to lead, it will seek partners when not under direct military threat. May 28, 2014  Targeting what he calls "misleading" statements about his work for the U.S., former NSA contractor Edward Snowden tells NBC's Brian Williams he "was trained as a spy" and lived under a false name.